ClassJuggler founder Jon Koerber was just published in the most recent issue of Dance Exec Magazine. Check out his guest article Five Key Reasons to Offer Customers Online Credit Card Payments. To learn how ClassJuggler can make it easy for you to accept credit card payments at your school, read about our merchant processing add-on feature. This entry was posted in Cheer ClassJuggler, ClassJuggler Dance, ClassJuggler Dojo, ClassJuggler Fitness, ClassJuggler for Franchises, ClassJuggler K-12, Music ClassJuggler, School Management Tips, Swim ClassJuggler and tagged accepting credit cards, merchant processing on August 29, 2014 by classjuggler. We have exciting news for our current customers that use the Customer Self-Service Center feature. The release tonight of ClassJuggler version 6.4.1 introduces several exciting and requested enhancements to our Customer Self-Service Center. And, as always, ClassJuggler upgrades for our users are totally free and require no computer installation to take access the new features. Some of the most anticipated features we’ve added to this release are enhancements to how ClassJuggler calculates class capacities for online class shopping orders. Essentially, this enhancement gives you the option to add all pending enrollments (classes in an order before they are processed) to the capacity checks of a class. How it works: Let’s say you have a class with a capacity of 10 students, and you currently have six students enrolled. Then, during an open enrollment period, four customers check-out of your online ClassJuggler-powered Self-Service Center with that class in their shopping cart. If you enable the new “Pending Enrollments in Capacity Checks” option, the class will now be considered full even if you have not yet approved any of the incoming orders. This prevents class over-booking – especially helpful in situations where you simply cannot review and process orders fast enough. With this new feature, you’ll eliminate over-capacity problems. These class capacity enhancements are also available in the free Real-Time Class Listings feature, but you’ll need to regenerate the code for your Web site to enable this feature – something we can help you with individually via ClassJuggler customer service options or in an upcoming webinar. 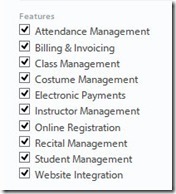 The options are set individually for each class store or each real-time class listing you design. This new option that allows you to add a “Pending Enrollment Buffer” to each class’s pending enrollment counts. Think of it as a safety net that kicks in when people are signing up for one of your open classes online and it’s filling up. The feature lets you intentionally go over capacity to make room for waiting lists, or make room for possible cancelations you anticipate from online orders. Example: Let’s say you have a class with a capacity of 10 students. You set up your online class signup “store” to include pending enrollments in capacity checks and allow for a buffer of, say, two pending enrollments. If you already have six students enrolled and, during an open enrollment period, four customers “check out” of the Self-Service Center with that class in their shopping cart, the class will still show as open and available until two enrollments over 10 are received. When you’re setting up a class to go into your online customer self-service center, you’ll now be able to choose (under the Online Shopping Page configuration tab) to have ClassJuggler’s software run a verification check before they can check out to make sure the customer has paid off their current balance due. Another important change to the behavior of the Customer Self-Service Center is the option for you to display FULL classes, so they still show up online, but cannot be added to the customer’s shopping. Before the ClassJuggler upgrade, even a class filled to capacity would allow additional orders. Now, with the new pending enrollments features, full classes will no longer accept additional enrollment orders. The class will still be displayed to a customers, if you chose to display classes that are full, but the customer will not be able to add the class to their cart. This is just a summary of selected items from the full release. You can get the complete release notes on the HOME BASE page after you log in to ClassJuggler. We also plan to have a webinar or two to introduce these new features to our current customers. Stay tuned…. This entry was posted in About ClassJuggler, Cheer ClassJuggler, ClassJuggler Dance, ClassJuggler Dojo, ClassJuggler Fitness, ClassJuggler for Franchises, ClassJuggler K-12, Music ClassJuggler, Product Info, Swim ClassJuggler and tagged ClassJuggler upgrades on August 25, 2014 by classjuggler. 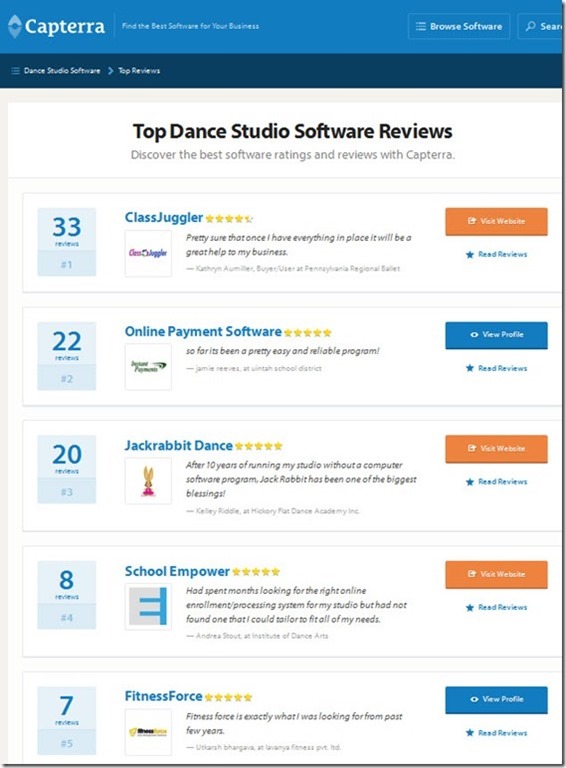 And the most important step you’ll make this year as a dance studio owner is letting ClassJuggler Dance’s studio business management software help you put your focus back on your students! 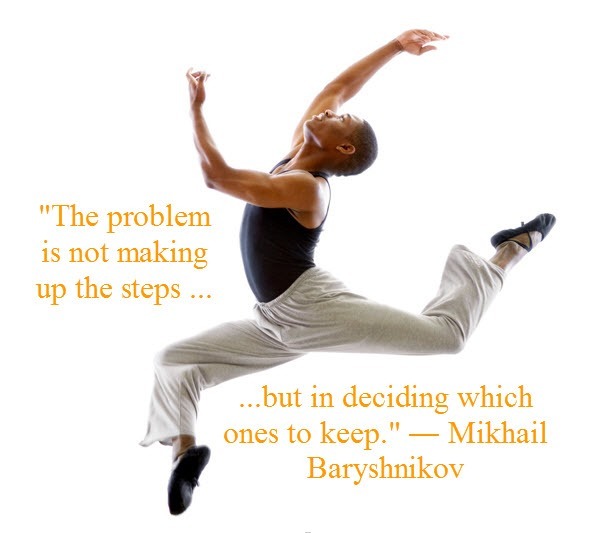 This entry was posted in ClassJuggler Dance, Motivation on August 18, 2014 by classjuggler. Online service trumps DVD software, hands down! Is online software, like ClassJuggler, the better solution for class-based businesses, or is it better to buy traditional disc-based or downloadable software programs? You often must go through difficult installation procedures..
You will likely pay extra money to use the software on multiple PCs. You normally must pay again for every product upgrade. You risk losing important business data when a hard drive fails or your computer is stolen. The software you need may not be availably on your mobile device – the tool of choice for many small business studio owners and for instructors. No software to install—ClassJuggler works with your Web browser. Anywhere you have online access, you have ClassJuggler at the ready. Never fear losing data—ClassJuggler keeps your software and data “in the cloud,” not on your computer. It’s safe and secure on state-of-the-art secure servers, backed up nightly. And relax knowing ClassJuggler has a history of reliable uptime currently at 99.99918% over a 10-year period. Free and painless updates!—Online solutions, such as ClassJuggler, improve with new features and functionality, and yet with no charge or effort to upgrade. The upgrades happen instantly, invisibly; new features and functionality are available the next time you sign in, with no updates needed to your PC. Access even without your PC!—With your data stored on online servers, it means you can get into your password-protected ClassJuggler account anytime and anywhere. No platform limitations—Many online programs such as ClassJuggler are compatible with either Windows PC or Macintosh™ compatible, and may even work with your iPad®, iPhone®, or Android™ tablet. To learn more about ClassJuggler’s features, go to http://www.classjuggler.com/cj/pub/features.html. This entry was posted in About ClassJuggler, Cheer ClassJuggler, ClassJuggler Dance, ClassJuggler Dojo, ClassJuggler Fitness, ClassJuggler for Franchises, ClassJuggler K-12, Music ClassJuggler, Product Info, School Management Tips, Swim ClassJuggler and tagged online vs. disk software on August 12, 2014 by classjuggler. Studio Management Software – Can I Justify the Cost? In a recent article, we introduced the five most important questions you need to answer to determine if now is the right time for you to begin using a software product to manager business. Does my studio’s business income justify the cost of business software? Have you heard of the term cost-benefit analysis? When it comes to purchasing business management software for your studio/school, this means that you need to determine if the cost of the software will sufficiently save you from the costs of your current business inefficiencies if you were to continue doing things manually rather than benefiting from the efficiencies and knowledge you’ll gain from using a powerful business management tool. Consider, for instance, the amount of time it takes to track your income and expenses using paper and pen, or even Microsoft Excel. Then also consider the amount of time it takes to use that handwritten data to analyze how your business is doing, such as tracking month-to-month expenses, income, or business growth. This kind of business insight – just a click of a button when you are using software to track those expenses, income, and student info – is either painstakingly slow or nearly impossible to achieve without a software system to crunch the numbers for you. In other words, since time is money – whether it’s your own time or hourly wages you are paying to a staff member to manually manage business information – the cost of purchasing a powerful studio management software system (online or computer-based) becomes negligible compared to the amount of time the software can save you, or the amount of insight you will gain that can positively affect how you run your business. The more your business grows, the more complex it will become and, therefore, the more important it becomes to your profitability to have the power and efficiencies that the right studio management software solution can give you. Consider, for example, the challenge that ClassJuggler customer Jennifer Reid, owner of Kinderdance of Alamo City, faced as her business grew – and the paperwork along with it. As a business owner, she explained to us that she urgently needed to find some kind of software solution that would enable her to keep better and faster accounting on new and present customers, making it easy to pull up data, run reports, and more. As a franchisee, she also dealt with the monthly paperwork requirements with the franchise owner. “At the time,” Reid says, “We were using paper reports, and it was very time consuming,” taking time that she would rather spend on her students! “Time is money, and doing reports doesn’t make you money; serving customers does,” she said. In Jennifer’s case, the cost-benefit analysis was a no-brainer – the ongoing subscription cost of ClassJuggler was a drop in the bucket compared to the time she previously spent operating her business. If the time you’re spending on the business of managing your business is becoming unmanageable, it’s probably beyond time for you to make the investment in one of the leading online software management solutions available to class-based businesses. When comparing solutions, look at the real upfront and ongoing costs of each studio business management software program you are considering, estimate the amount of time you will save monthly by using the software. Use that math to see if you can justify the investment for your class-based business in the purchase of your selected business management software. 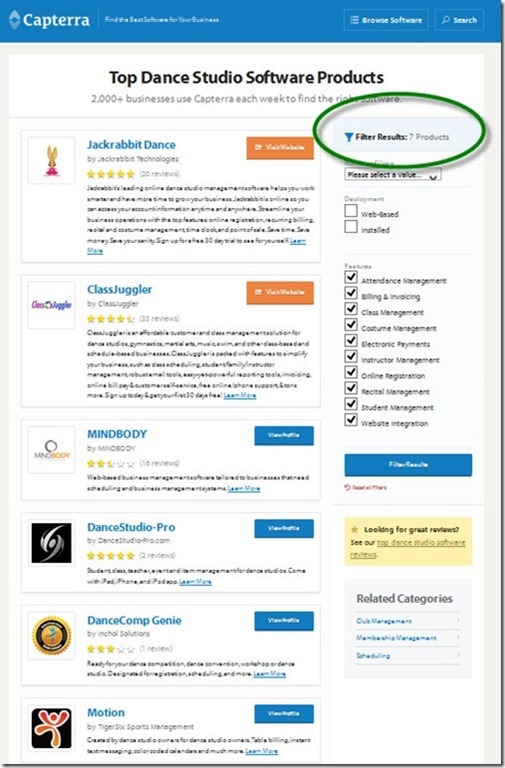 CheerClassJuggler – online gymnastics and cheer management software designed to streamline the business of operating your gymnastics school or cheer camp. This entry was posted in Cheer ClassJuggler, ClassJuggler Dance, ClassJuggler Dojo, ClassJuggler Fitness, ClassJuggler K-12, Music ClassJuggler, School Management Tips, Swim ClassJuggler and tagged business management software, class-based businesses, cost-benefit analysis on August 11, 2014 by classjuggler.